Rice Krispies treats are tried and true easy kid recipes. They're always a hit! Why not delight your sweetest eaters with these Rice Krispies treat variations? They're just as simple and foolproof, but with a few simple ingredient twists you'll have brand new easy dessert recipes at your — sticky! — fingertips! Everyone loves the ooey-gooey deliciousness of a classic Rice Krispies treat, and absolutely no one can resist a Rice Krispies treat taken up a notch. Food bloggers share their best and most creative Rice Krispies treat variations. 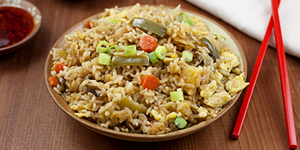 All you have to do is decide which recipe to try first! Lauren Kelly is a nutritionist, food blogger and cookbook author of The Everything Wheat-Free Diet Cookbook and the soon to be released The Greek Yogurt Cookbook. 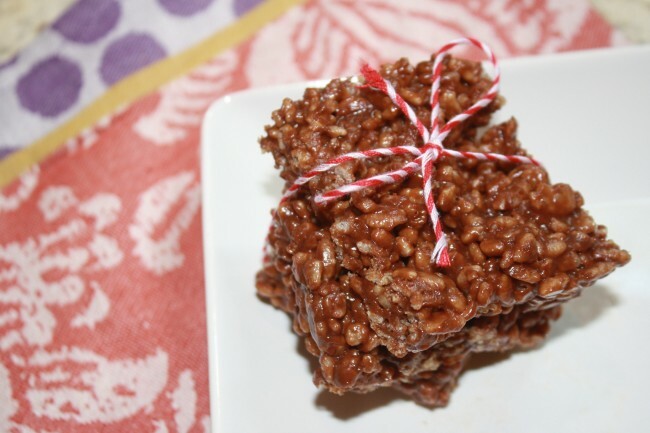 Lauren's favorite Rice Krispies treat recipe is her Peanut Butter Chocolate Crispy Treats! Kristen Smith, M.S., R.D., L.D., is the blogger behind 360FamilyNutrition, a blog dedicated to promoting healthy eating within the entire family through simple and delicious recipes. About her Low-Fat Candy Cane Rice Krispies Treats, Kristen says, "Candy canes are added to a low-fat Rice Krispies treat recipe to create a minty, healthy spin." And about her Pistachio Rice Krispies Treats, she says, "Pistachios are added to a lower fat Rice Krispies treat recipe for a salty, sweet, gooey creation." Sara Lewis blogs at Our Bacon Today, a blog featuring many dessert recipes using trendy bacon as a key ingredient. 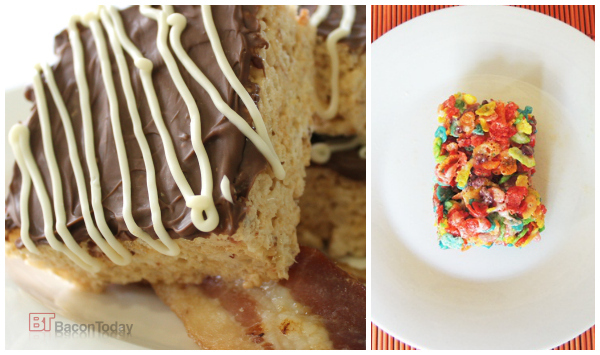 Sara's Chocolate Bacon Rice Krispies Treats are sure to please kids and adults! Tésa Nicolanti is the blogger behind 2 Wired 2 Tired. About her blog, Tésa says, "My kids are 14 months apart and they are always wired leaving my husband and me always tired." And about her Fruity Pebbles Treats, she says, "This is a delicious and colorful take on a classic after-school snack." Maria Provenzano's blog, MariaProvenzano.com, is a food and lifestyle blog that's making domesticity fashionable again by creating a beautiful life with your own two hands. 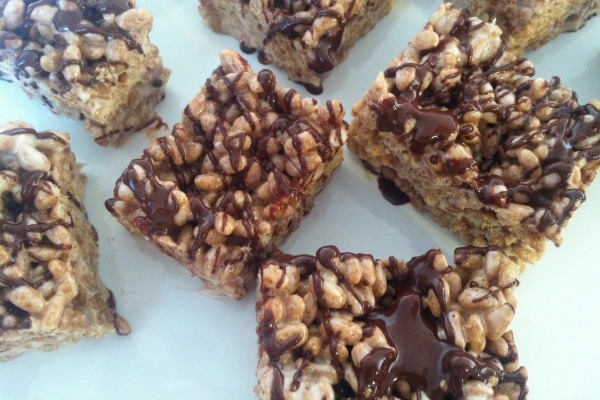 Maria's Rice Krispies Treat Upgrade is made the DIY way. She says, "Make your Rice Krispies gourmet with homemade marshmallows (made without corn syrup) and topped with decadent dark chocolate." Marcia Kellogg is the author of Food for Thought, where she shares culinary advice for the everyday cook. 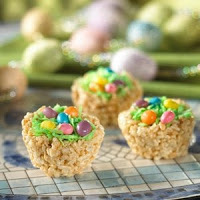 Her creative Rice Krispies treat recipe is her Robin's Egg Nest Treats! Chef Stacey Stabenow invented the company No More To Go. 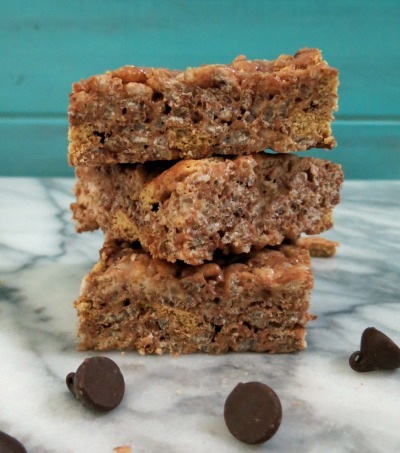 In a fun Rice Krispies twist, Stacey makes Peanut Butter Chip Cereal Bars! Jennifer Drummond blogs at Peanut Butter and Peppers, a healthy living blog that takes everyday food and makes it healthier without sacrificing the flavor. One of Jennifer's favorite treats is her S'more Rice Krispies Treats. 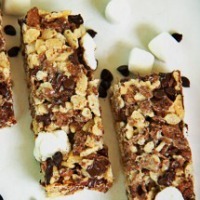 Jennifer says, "This is a lightened up Rice Krispies treat made with sweet chocolate and crushed graham crackers mixed together with gooey marshmallow and Rice Krispies." Kristen McCaffrey blogs at the Slender Kitchen where she creates healthy and delicious recipes and meal plans for stress-free eating and weight loss. Kristen's signature Rice Krispies treat is her Toblerone Rice Krispies Treats. She says, "It's the perfect crispy and chocolaty snack for only 128 calories!" Kristen also has an irresistible Pumpkin Rice Krispies Treats recipe. She says, "Delicious Rice Krispies treats infused with pumpkin and fall flavors for only 124 calories each!" Joanie Zisk is a wife, mother of five, freelance writer and blogger at ZagLeft.com, where she writes about great recipes, wonderful wines and amazing travel experiences. 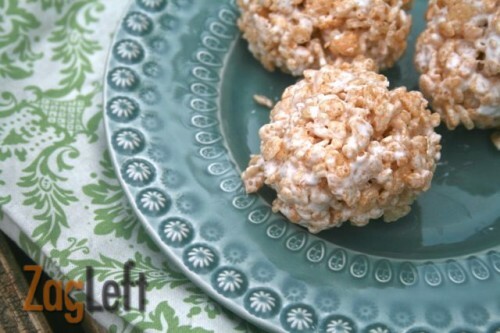 Joanie's clever Rice Krispies treat recipe is Rice Krispies Treats For One. She says, "Rice Krispies Treats For One are made in the microwave and are perfect for college students or anyone wanting just a little something sweet!"